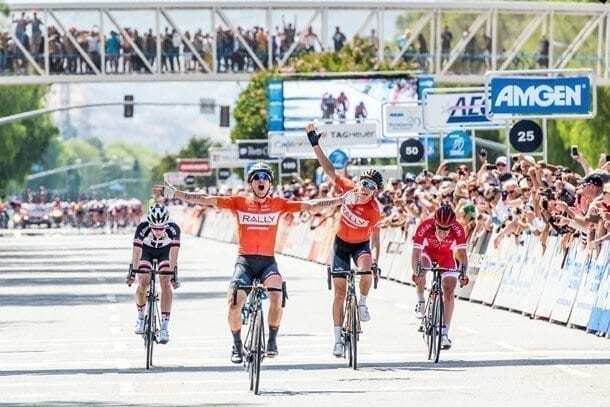 U.S. team Rally Cycling’s Evan Huffman (El Dorado Hills, Calif.) made history at the Amgen Tour of California today by becoming the first UCI Continental Team rider to win a WorldTour race stage, made even more remarkable when teammate Rob Britton (CAN) claimed second place. 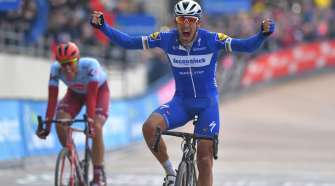 The Amgen Tour of California joined the UCI WorldTour this year, which designates the top races in the world and does not permit Continental team participation. 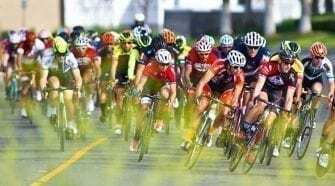 However, the California race and was given a special allowance in its first year on the WorldTour for two Continental teams to compete (the two selected were Rally Cycling and Jelly Belly p/b Maxxis). “This is obviously, being a Continental team, the first WorldTour race we’ve ever done, and to win a stage is just incredible… we just worked so hard all year so everyone’s just over the moon thrilled,” said Huffman. Huffman and Britton, along with four fellow breakaway members, narrowly held off a thundering peloton filled with WorldTour sprinters hungry for the stage win in Santa Clarita. This is Huffman’s first win at his home state race. In similar fashion, Huffman placed second in last year’s Stage 2 from South Pasadena to Santa Clarita, and rode on to clinch the 2016 race’s King of the Mountain (KOM) classification win. Rally teammate Rob Britton (CAN), also part of today’s breakaway, finished in second place, with Professional Continental Team UnitedHealthcare Pro Cycling’s Gavin Mannion (Austin, Texas) placing fifth. Huffman’s determined ride also won him today’s Breakaway from Cancer® / Breakaway from Heart DiseaseTM Most Courageous Rider Jersey. Stage 4 presented by Visit California took the cyclists on a 99.1 mile route into Los Angeles County, from the coastline of Santa Barbara to Santa Clarita, which holds the race record for hosting the most stage starts and finishes (13). Early in the race, a break of six escaped, containing Huffman, Britton, and Mannion; Team Sunweb’s Lennard Hofstede (NED); Cofidis, Solutions Crédits’ Mathias Le Turnier (FRA); and BMC Racing’s Martin Elmiger (SUI). They led the field by about 9 minutes with 50 miles left in the race, the largest lead on the road so far at the 2017 Amgen Tour of California. Teams with sprinters in the hunt worked at the front and steadily brought the gap down to six minutes on the short but steep KOM climb up Balcom Canyon Rd. (11.8% average grade), where thousands of fans were gathered to cheer on the world-class peloton. With five miles left to ride, WorldTour teams took turns at the front pulling the peloton on a massive chase effort, continuously shaving seconds off the gap and finally getting the lead group in their sites in the final meters of the race. But it came too late, and the breakaway held on with Huffman attacking to the finish line. The peloton pulled in 13 seconds later, suffering from their punishing chase pace. BORA-hansgrohe’s two-time World Champion Peter Sagan (SVK), who won the Amgen Tour of California by seconds in 2015, finished the stage at the front of the main field to keep a large-margin hold on the Visit California Sprint Jersey, which he won yesterday. George Bennett (NZL) (+:02) and Team Sky’s Ian Boswell (Bend, Oregon) (+:14). Tomorrow’s Stage 5 presented by Lexus will take the cyclists 77.9 miles from Ontario to the top of Mt. Baldy. The Queen Stage of this year’s race includes a whopping 12,000 feet of elevation gain and a fan-favorite summit finish at Mt. Baldy. The 2017 Amgen Tour of California will conclude Saturday in Pasadena.